Downtowns and active urban cores have become so successful that the ripple effect is spreading to adjacent historic industrial districts. The boom of places like Denver’s River North District have demonstrated the attraction of gritty neighborhoods as centers of authenticity that are the antithesis of suburban lifestyle centers. The gentrification of these industrial areas, which could be considered “INDentrification,” has created an opportunity for reclaiming and repurposing the public realm of streets and rail corridors as pedestrian thoroughfares. The transformation of contaminated buildings through brownfield revitalization is driving the installation of civic promenades in many communities, which is helping to foster placemaking benefits in forgotten remnants of cities. The design interface of industrial placemaking, the nexus of form and function, create challenges for transforming corridors that were created for trucks and trains to support mixed-use development around intense pedestrian backbones. INDentrification is also driving significant reinvestment and the evolution of craft employment embodied in the maker’s movement, a growing economic trend that is highly dependent on quality public places. Emerging communication tools are helping to expand the dialog between designers and residents, which ultimately enhance the overall function and personalization of place. Using 3D modeling, these public spaces can be virtually revitalized as the first cost-effective step to pumping enthusiasm into character-laden districts once forgotten and ignored. Figure 1 - The Steam Plant in Cheyenne, Wyoming stands as an icon on the skyline, looming empty, waiting for new development to take root. Driving into nearly every community, there are routes through town that you'd rather avoid in presenting the community's first impression to important guests like a respected colleague or mother-in-law. Cheyenne, Wyoming, is no different. Almost every authentic community has areas where the vestiges of industrial grit have suppressed property values and scared investment elsewhere. Although not typically topping the list of standout historic architecture, these warehouse districts benefit from the recent romanticism of all things bohemian. From craft brews to artisan makers spaces, today's hottest reaches of redevelopment function like a hipster relocation program. This process of "INDentrification" is materializing in metro areas across the country. One dramatic example is the River North Arts District in Denver. As recent as 10 years ago, the neighborhood was dominated by nondescript, ash-laden behemoths nobody would ever have guessed would become the hottest zip code in the Mile High City. Historically, the area's proximity to the both rail and stockyards made it the perfect location for drill manufacturers, foundries, and other auto-oriented repair shops. With few neighbors residing in the immediate area, complaints about smoke and noise were kept to a minimum. Yet the dramatic rise in values in the neighboring Ballpark and Lower Downtown districts has pushed creatives to "drive 'till they qualified" so to speak in an area that didn't appear receptive to gentification. The conversion of formerly prime industrial properties gained traction thanks to the white-hot real estate market, a pending light rail transit station, and growing cultural appetite for architecturally honest spaces. Figure 2 - The Source, Denver, Colorado. River North Arts District was one of the first pioneering revitalizations in this industrial district turned arts mecca. This former foundry is now home to a variety of restaurants, food vendors, a flower shop and brewery. In areas lacking hipster-haven status, the rebirth of depressed industrial areas often struggle with downward pressure from a neighboring downtown district who's redevelopment economy isn't yet firing on all cylinders. This raises debate as to whether public investment in adjacent depressed neighborhoods serves to siphon away investment potential from the core of downtown. Novice urbanists might argue this point in a race for resources in which any funds spent outside the perceived core threaten investment in downtown proper. This perspective is flawed and highly dependent upon the local market. If core revitalization opportunities exist, but are sluggish due to overinflated building prices, development in downtown proper is unlikely to take root due to the increased risk and limited return on investment. With the entry of a new frontier of development potential, perceptions of property value can change with new opportunities entering a limited marketplace. Further, the flexible floor plates of wide open industrial spaces are malleable enough to accommodate just about any modern use, including manufacturing activities like brewing, niche clothing fabrication, food service, and restaurants. These industrial spaces fill the "missing middle" of commercial space, bridging the gap between food truck or garage workshop and class A lease spaces. These lower rent districts give budding entrepreneurs a place where rents haven't outpaced the bootstrap ambition driving small cap business investments. While the conversion of industrial buildings is relatively efficient for a diversity of uses, the infrastructure surrounding these spaces oftentimes isn't structured to support significant densification and walkability that accompanies mixed-use development. Streets with larger block structures accommodated semi-trailer deliveries but didn't contemplate cyclists or pedestrians in large numbers. Rail-served industrial sites border low volume tracks with slow moving freight delivered to fewer and fewer manufacturers. Overly wide streets enabled larger amounts of traffic to pulse through these growing areas, but the slow transition of infrastructure from old to new uses can leave early arrivals with a mixed bag of safety as some industries hold on despite the gentrification of the marketplace. Conversion of street corridors into multimodal transportation passages is a critical step in legitimizing the transformation process. Establishing linkages to core population and job centers with these emerging districts signals that the long-term evolution is supported by local government and can trigger investment. Yet without exceptional urban design and accommodation of bike, pedestrian, and transit amenities, these connections will fail to fully cater to the lifestyle that makes walkable redevelopment districts attractive. Shade trees, bicycle boulevards, and adaptations to blank industrial facades help to reclaim spaces initially geared to work-a-day manufacturers whose labor forces escaped pollution to streetcar suburbs. Communities looking to advance transformation can rely on creative placemaking to leverage public investment into private sector horsepower. Such changes are taking place with the assistance of programs like the Environmental Protection Agency's (EPA) Brownfield grant program. These grants are used to assess and remediate these sleeping giants to unlock development potential. In many fringe communities, these grants may be the only way to broach the discussion of a new life for underutilized districts. Understanding the implications of environmental contamination can take tens of thousands of dollars in up-front analysis before properties transactions take place, increasing the likelihood that a stigma can suppress revitalization, even if the impacts from historic industrial uses are minimal. By providing grant funds, the EPA has helped to jumpstart projects across the country, reducing the upfront financial burden of prospective buyers and recalcitrant sellers. Gaining a clear picture based on scientific evidence can help to greenlight projects where the specter of contamination stalled investment. For sites that do have bona fide environmental issues, the program also identifies a remediation process to characterize the extent of contamination while outlining a cleanup process. Often, knowing the process and cost of cleanup can help in facilitating discussions about how a project can move forward because the unknowns have been removed. The environmental characterization provided by the EPA Brownfields program would alone be considered a successful tool in promoting redevelopment, however a segment of the funds can also be used for remediation plans, which often contemplate the public realm adjacent to brownfield sites. Jump starting revitalization discussions is greatly aided by the emerging availability of digital visualizations. Typical commercial development depends on a series of risk analysis considerations. For investors, using text to describe a common concept like a retail strip center proposed adjacent to a Walmart is a comfortable development pattern that developers frequently encounter. Yet the idea of pioneering hulking industrial sites into vibrant mixed-use districts can be daunting, particularly given exterior appearance of early stage redevelopment initiatives. If these types of revitalizations were simple to cash flow, every reasonably vibrant community would be experiencing similar transformations. Yet the risk inherent when proposing an INDentrification project is enough to send a typical financier scrambling for the exits. The same concept applies to taxpayers who ask community visionaries to "Show me the money." That's exactly what the EPA Brownfield program’s assistance can provide in terms of planning work that can give projects a much-needed boost. Placemaking designs are the low-hanging fruit for revivalists to demonstrate the energy and excitement embodied in industrial renovations. With the assistance of the EPA Area Wide Brownfield Grant, the City of Cheyenne was able provide a glimpse of potential in an underutilized rail spur connecting the Burlington Northern to the Union Pacific yard. About 100-mile due north of Denver’s RINO district, this community’s downtown core has struggled with revitalization costs associated with large historic commercial buildings. As part of Cheyenne’s broader West Edge District revitalization, this central infrastructure enhancement has blurred the lines, inextricably linking placemaking and infrastructure development. The creative industries interested in locating businesses in the area are making their decisions based on new era infrastructure requirements. Without architectural authenticity, quality food and beverage purveyors, along with outdoor recreation amenities, these growing companies can't attract a quality workforce whose values demand work-life balance, shunning cubical farms for red brick and old growth oak beams. Merging an enlightened perspective on infrastructure, the Cheyenne Spur first used static drawings to illustrate the potential to create a linear parkway alongside the track that sees a handful of trains over the course of 24 hours. Imagining the types of businesses that could occupy the vacant spaces abutting the tracks, these illustrations sparked enthusiasm to add an urban-flavored business park to a community interested in attracting technology and a workforce interested in lifestyle amenities. Without walkable streets, access to coffee shops, breweries, and restaurants, these up and coming districts are unlikely to attract the businesses whose workforce are demanding quality spaces to balance their work life. Yet entrepreneurs are willing to take a chance on the potential of a gem waiting to be polished. Figure 5 - The Sheridan Iron Works 3D Digital Animation flies the viewer past a reimagined building, teaming with activity to illustrate the redevelopment potential. Significant investment can be secured simply by generating a motivating vision and effectively delivering the storyline. Using 3D animated video, today’s spectators have the opportunity to immerse themselves in the future of a district to all but touch the changes that wait just around the corner. Digital animation can help to bring to life a streetscape that’s currently nothing but crumbling curb merging into a hardscrabble frontage of weeds and gravel. The Sheridan, Wyoming, Iron Works Building is located adjacent to a thriving Main Street District and has the iconic potential with its eye-catching vintage roof sign. However, the condition of the public realm surrounding the property presents issues for developing an active hub that can pull tourists and locals alike from the primary downtown core into this emerging revitalization area. Using 3D digital imagery, the project is able to demonstrate the dramatic impact sidewalks, streetscape, seating spaces, and public art can have on the environment. Figure 6 - The Sheridan Iron Works streetscapes show animated street life with pedestrians interacting and walking on spaces that are currently unattractive and lack placemaking elements to support active uses within the building. These animations have the ability to attract initial building investors who grasp the vision and take the plunge into restoration, while eventually sparking the interest of business owners who might wish to locate within the project. Paired with the environmental studies initiated with the EPA Brownfields Program, communities have significant tools at their disposal to affect positive change. Yet financing public improvements in these INDentrification areas can remain a challenge. Similar to private sector investors, public leaders require similar encouragement to make decisions that are innovative in supporting redevelopment. Often, this support comes in the form of public infrastructure and placemaking that enables private reinvestment to thrive. 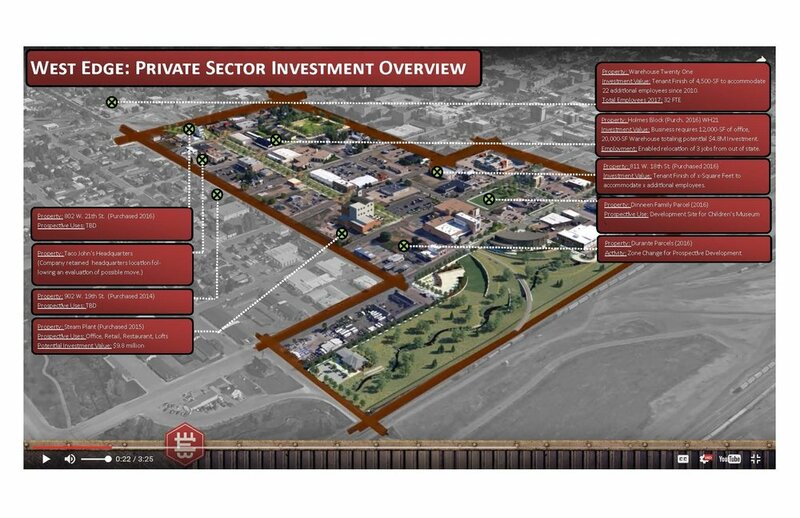 In the case of Cheyenne’s West Edge District, the overall vision developed with the assistance of the EPA Brownfields Program included a four-pronged approach to economic revitalization based on placemaking and public safety enhancements. By mitigating brownfields and addressing urban storm drainage concerns, the City has the opportunity to create meaningful park amenities that motivate reinvestment. Linkage of these four components is best illustrated in the “project compass” that guided the effort. Connecting different silos of community development projects helped to develop a strong support for the revitalization effort within the community. This strong vision also enabled the City to successfully secure grants for different elements of the program from diverse funding sources, including the Federal Emergency Management Agency and the U.S. Economic Development Administration. 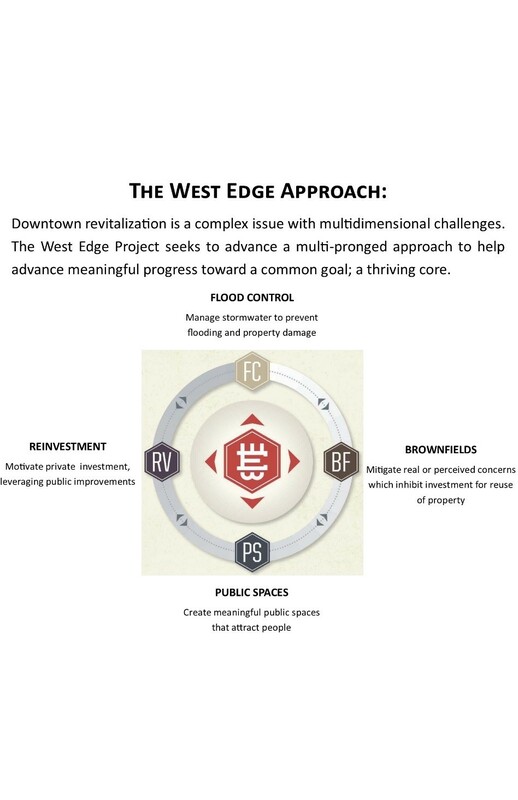 Figure 7 - The Project Compass was created to clearly explain the interrelated goals of the West Edge project. Two centerpiece elements of public placemaking provide the backbone of public spaces to generate an investment-ready environment. The first public feature would convert a sparingly-used public parking lot into a detention pond to address regional flood control as well as provide surface enhancements which create an amphitheatre and passive recreation space. Blending the functionality of purposes enables a broader set of outcomes to benefit the City’s residents while also making the adjacent depressed properties more desirable locations for revitalization. 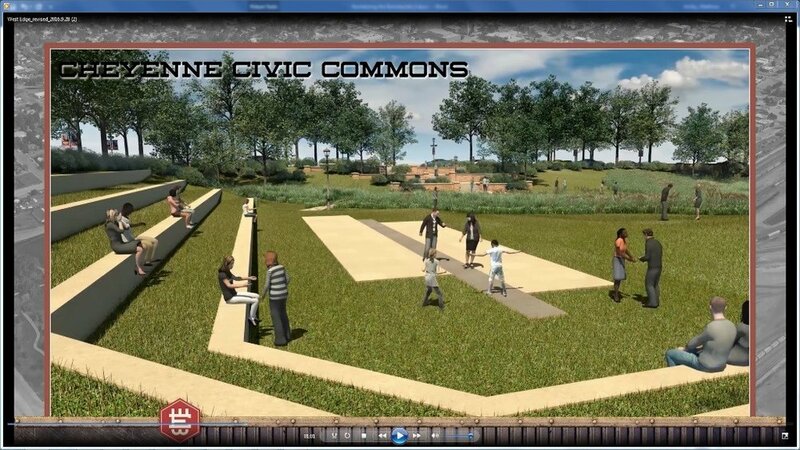 The Civic Commons, as the area is referred to, has the potential to accept stormwater flows from future development in the area, enabling more properties to build or convert underutilized lots into productive uses. By providing an alternative to on-site surface detention, this regional facility will help to reduce the overall cost of development on the private sector. Private investment has already taken note of this planned facility and the purchase of ramshackle collection of derelict warehouses is slated to transform into the headquarters of a design and marketing firm. When asked about their decision to invest, the founder described that his workforce values exciting public spaces and amenities provided by the Civic Commons. The second component of placemaking that is helping invigorate interest in the West Edge District is the conversion of the rail spur into a multi-modal transportation corridor. This spur experiences relatively little daily use with only a few short trains transferring freight cars from the Burlington Northern Railroad to the Union Pacific line. This unimproved right-of-way also conveys a stray passenger vehicle or two along the gravel stretch next to the rails. Developing a vision for cleaning up this space and activating additional uses alongside has sparked interest from recreation and non-motorize transportation advocates who would like to see a multi-use path constructed alongside the rail. Currently, there are no fences or barriers restricting access to the track, and enhancements would help to clear designate and distinguish pedestrian areas away from the train activity. Benefits of creating this public linkage would help to bring people into the West Edge District and increase mobility of residents and workers between attractions in the area. Establishing the vision was the first step in moving forward with conversion of the rail spur, yet 3D animation once again played a significant role in generating excitement and interest in the project. A video was produced demonstrating the enhancements in support of educating the public about a sales tax ballot initiative where $4 million was approved by voters to move this element forward into construction. Subsequent private interest in the West Edge District has been spurred by this visioning work and the cohesive partnership between the public sector placemaking efforts and private sector investment. Several properties, including the two largest and most iconic buildings, have changed hands with investment pending. Several other vacant parcels have also been purchased with the intent to construct new buildings on vacant or underutilized sites, bringing new investment and employment to the area. Figure 10 - Map depicting properties that have changed hands in anticipation of investment based upon the overall West Edge vision illustrated in the 3D animation. Several of these properties are awaiting construction of public placemaking infrastructure prior to initiating construction. One additional innovative tool used by the community to increase public awareness and understanding about the possible placemaking enhancements is the “West Edge Virtual Tour.” Launching from the 3D digital model that was used to create the animations, additional functionality was created to help more people access the vision and understand the goals of the West Edge project. This tool enables locals as well as investors to experience potential enhancements on their mobile device while they physically tour the district. The process began by geolocating specific site imagery and stitching it together with panoramic images enables the new renderings of projects to be viewed in context is supported with QR Codes that enable the user to scan the sign and immediately be delivered to the proper web location. This effort, which included placement of tour signs at key locations, helped to demonstrate how public enhancements could support adjacent private development. This tool has also attracted attention from developers and investors outside the immediate market who were able to experience the community’s vision from afar. Figure 11 - Virtual tour board demonstrating how to view the information when on-site. Several boards were placed at key locations throughout the district. This technology has been gaining in popularity to assist communities and developers in answering questions about how the public realm and private development might interact. Because of the efficiency inherent in creating digital modeling, this tool could help to relieve tension between proponents and opponents of infill development who would normally be arguing about design issues based on somewhat abstract 2D illustrations and drawings. These types of animations are likely to increase in use over time and help to generate better public discourse regarding the actual impacts of a development. Although the term “gentrification” has taken on a negative connotation for its recent history of displacing long-time residents of lower income neighborhoods, the conversion of industrial districts into mixed use neighborhoods is not always negative. Though some employment uses are pushed further from the core of cities, many of these industries welcome a move to new locations that are closer to interstate highways and provide larger tracts of land available to accommodate modern warehousing and shipping operations. Meanwhile, the additional investment within the core of a city can create a positive economic boost for communities while creating dense, walkable neighborhoods where few residents lived in the past. The challenge remains in retooling these transitioning districts to accommodate what could be termed the “adaptive reuse of neighborhoods.” However, with a new emphasis on placemaking and innovative public engagement strategies, communities can be successful in navigating the navigating the winding road to revitalize the ramshackle.